Rovsing has devised a standard modular platform for the measurement, acquisition, simulation and commanding functionality of EGSE systems. This platform is called MASC (Measurement, Acquisition, Simulation and Commanding). At the heart of the platform is the RO-104001 Modular EGSE System Motherboard, a Powerful FPGA based motherboard accommodating 5 daughter board slots. 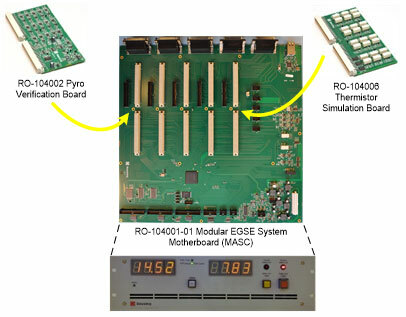 The RO-104001 may be populated by a range of Rovsing daughter boards (MASC I/O boards) which implement the electrical specifics of a systems input / outputs. Firmware within the motherboard automatically detects the type of each daughter board installed and is thereafter able to host and control the board without the need for manual configuration. The mapping of custom interfaces is achieved via the controller software. If necessary, hard real-time requirements across boards can be implemented in the FPGA firmware. Multiple pieces of equipment based on the MASC platform can be connected to the same TCP/IP network to support a virtually unlimited number of input/outputs for the types currently available from Rovsing’s family of MASC I/O boards. Furthermore, due to the simplicity of the communication scheme it is a simple task to implement custom electrical interfaces. An instance of the MASC platform occupies a standard 19’’ inch 3U unit sub-rack. The MASC unit itself contains internal over voltage protection which in turn prevents the propagation of any Power supply anomalies towards the unit under test. A fan provides active cooling of the sub-rack.